Preheat enough oil to deep fry the chicken feet. Preferably in a pot or wok that has a lid (because it will splatter when you deep fry them). You may need to do this in batches. While the oil is heating, get the seasoning ingredients ready. 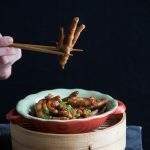 Deep fry the chicken feet batch by batch if necessary. Fry until they turn pale golden brown and dry, about 5 minutes. Remove the chicken feet and submerge into the ice-cold water. Repeat with the rest of the chicken feet. Let the feet soak in the ice cold water for 2 hours.